This image-rich NASA Earth Observatory article discusses how Ken Carder and his research team are using remote sensing data and offshore monitoring to find and track harmful algal blooms as they form and spread. 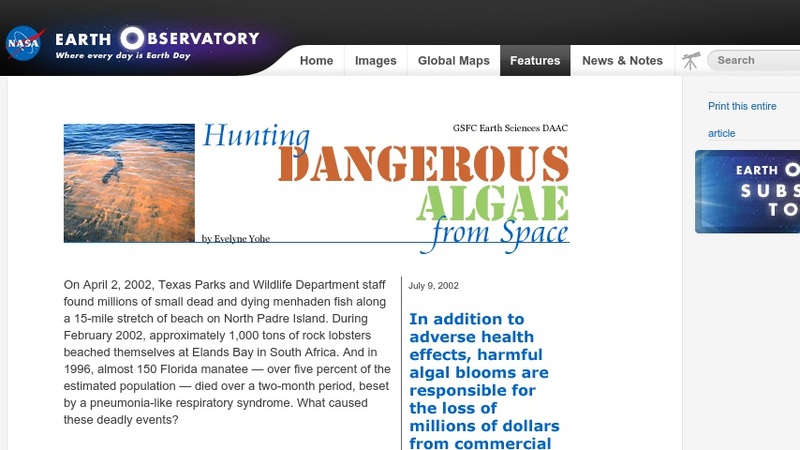 Methods of correlating satellite data with field data and modeling are allowing scientists to determine the causes and precursors of harmful algal blooms. With that knowledge comes the possibility of detecting the start of a bloom, alerting coastal communities earlier, and mitigating some of the red tide's toxic effects, such as fish kills and shellfish poisoning. The article contains a glossary, that may be clicked on and off, and links to related websites.